1. Go to the gift certificates page to choose which certificate they wish to purchase. 2. Fill out the gift certificate form, designating whether they want us to automatically notify the recipient about the gift or if they would prefer to do the honors themselves. 3. They then add the item to their cart and check out as usual. 4. Once they submit the order, an html-formatted email that coordinates with the colors of your website will automatically be sent with instructions on how the recipient can shop on your site. You will also be notified by email that someone has purchased a gift certificate. Payment methods for purchasing a gift certificate will be the same as for other purchases on your site. If you do auto-payment processing for credit cards, the gift certificate will be available to use right away. If you do not do auto-payment processing, or if someone chooses a method other than credit card, then you will need to activate the gift certificate in your Site Manager once payment has been received. Access your Gift Certificate Manager by clicking "gift certificates" in the upper left corner of your Site Manager. 1. Active status. The Gift Certificate will be Active automatically if you use real-time payment processing (Visa, Mastercard through a gateway such as Authorize.Net). The default is $0, so if you want a higher amount, this will need to be set manually. This will show when the gift certificate is used and if there is any remaining amount. You may add additional notes. 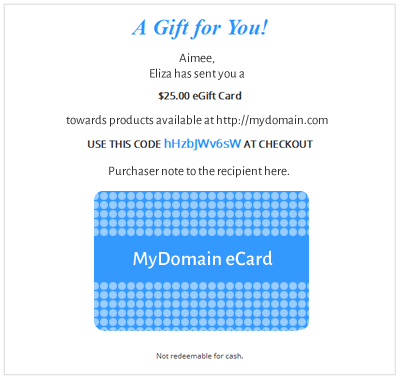 You may set up gift certificates manually by clicking the "New Gift Certificate" link and entering, at minimum, the active status, code, and dollar amount. You would need to notify the recipient with the code. In version 4.x, gift certificates are added as items in the Gift Certificate category. Each gift certificate can be set up to be for a specified amount, or an amount the customer chooses. During the default set up, one of each type is automatically entered in your gift certificates category. 1. Set the price and the minimum price to the same amount and be sure the "allow price override" field is set to "no". 2. Be sure to change the item type to "Gift Certificate". You shouldn't need to add any additional customer-choice gift certificates. If you do, be sure to set the item type to "Gift Certificate" and "allow price override" to "yes". If you don't want to offer the default customer-choice item, you should just hide it. You can set a minimum order amount for customer-choice gift certificates. If you allow your customers to use website-purchased gift certificates in your brick-and-mortar store, we now have a feature that allows you or your store employees to update the amount of the gift certificate online without logging into your Site Manager. Let MightyMerchant know if you are interested in adding this feature. Basic layouts use your logo, which you will load as the category image. This is a very basic email layout -- text only. To choose this layout, select "default" from the Component Layout menu. With this layout, your customers can choose from a variety of ribbon colors. Select "logo-bow" from the Component Layout menu. Upload your logo into the Gift Certificate Logo category. Select "logo-card" from the Component Layout menu. 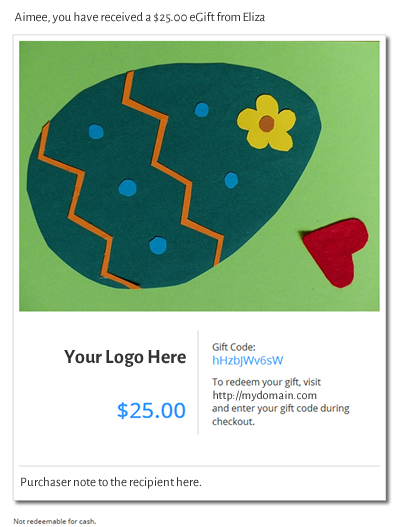 Custom layouts allow you to create multiple gift certificates with different images. You might want to choose these layouts if you would like to offer different designs for holidays or other occasions. First, click directly on the Gift Certificates category name to edit the category. Select "pimage-layout1" from the Component Layout menu. Next, set up each gift certificate as an item in the Gift Certificates category. For each item that you add, you will upload an image in the product image field. Upload your logo to the category logo field. Select "pimage-layout2" from the Component Layout menu. Don't put anything in the Gift From or Buyer Email fields. 4. On the main Gift Certificates page, click the Resend link for the newly-generated gift certificate.